U.S. under Trump Series: Is Federal Reserve losing independence in Trump era? Bank of Japan (BoJ) is lined up for its monetary policy on Thursday, to maintain negative rates on hold. We ruled out slow normalization of monetary policy, as inflation in Japan has so far made no attempt to approach the BoJ's 2% inflation target. The BoJ is no longer expected to raise the yield target in 2020 given the downgraded inflation outlook. USDJPY hedging updates: USDJPY dipped from 112.137 to the recent lows of 110.746 levels, but the defensive yen has lost somewhat from last two days. Most importantly, the positively skewed IVs of 2m tenors are still signifying the hedging interests for the bearish risks. The bids for OTM put of these tenors signal that the underlying spot FX likely to break below 109 levels so that OTM instruments would expire in-the-money. Amid low vol scenarios among G7 FX space, the other feature of the USDJPY vol surface that has received more than its fair share of attention this year is risk-reversals. 1Y 25D riskies @ 1.7 vol bid for USD puts/JPY calls over USD calls/JPY puts are wide by historical standards and nominally as stretched as at the height of the EMU’11 and EM ‘15/’16 market crashes. This is not as anomalous as it appears at first glance, however, since the recent skew widening can be entirely justified by the surge higher in US rates, and hence US – Japan rate differentials, through the past 3 years of Fed hikes. USDJPY risk-reversals ought to bear some link to the level of the rate differential / forward points, because the absence of such a relationship in extremis, consider zero risk-reversals when policy rate differentials are north of 300bp – would allow market participants to construct delta-hedged risk-reversal packages (long USD puts/JPY calls + short USD calls/JPY puts + long USDJPY forwards as the delta-hedge) that are convexly geared to a market crash, while also earning abnormally large ex-ante static carry via the forward delta hedge. Convex crash hedges ought to cost, not earn, carry to hold, hence such unusually attractive risk-reversal vs. forward point set-ups tend to attract enough investor interest to buy riskies that raises their cost to levels more commensurate with forward points. 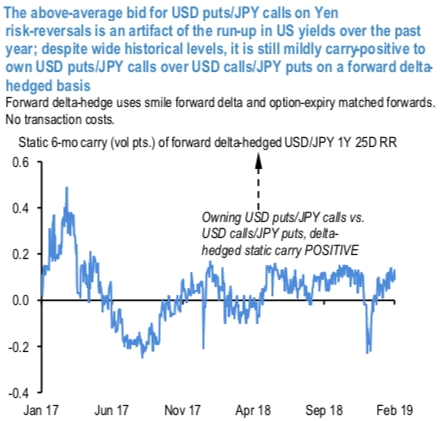 The flow culprit behind Yen riskies having climbed to the levels that they have currently is likely Japanese exporter and/or institutional hedging demand for USD receivables/assets. They would have very likely done the carry math and arrived at the conclusion that risk-reversals were the more carry-efficient vehicle to sell dollars. Currency Strength Index: FxWirePro's hourly USD spot index is flashing 5 (which is absolutely neutral), while hourly JPY spot index was at 116 (bullish) while articulating (at 12:55 GMT).